The Boston Bruins travel to Wells Fargo Center to play the Philadelphia Flyers on Thursday, September 28, 2017. The opening line for this game has the Bruins at +125 and the Flyers at -155. Boston had a record of 44-31-7 last season and on the road they had a record of 21-14-6. They finished 3rd in the Atlantic Division. They scored 234 goals and gave up 212 goals for a point differential of +22. For the season they had an ATS record of 46-42-0 and an over/under record of 40-40-0. Philadelphia finished with a record of 39-33-10 including 25-11-5 at home last season. They were 6th in the Metropolitan Division. They scored 219 goals and surrendered 236 for a goal differential of -17. Their record against the spread was 39-43-0 while their over/under record was 37-37-0. Brad Marchand accumulated 85 total points last season for the Bruins. He had 39 goals last year with 226 shots on goal giving him a shooting percentage of 17%. He had a total of 46 assists on the season and averaged 19.4 minutes played per game. 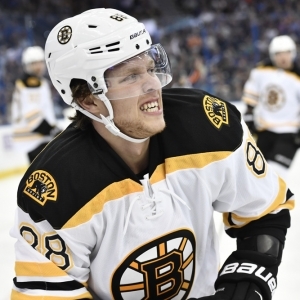 David Pastrnak averaged 18 minutes of ice time per game last year. In that time he had a shooting percentage of 13% by scoring 34 goals on 261 shots. He had 36 assists giving him a total of 70 points on the season. Tuukka Rask had 37 wins and 20 losses last season in net for the Bruins. He had 1,610 shots against him and he gave up 137 goals. He made 1,473 saves for a save percentage of 92%. Claude Giroux scored 57 total points last year for the Flyers. He had 14 goals last season with 196 shots on goal giving him a shooting percentage of 7%. He had a total of 43 assists on the season and averaged 19.2 minutes played per game. Wayne Simmonds averaged 19 minutes of ice time per game. In that time he had a shooting percentage of 14% by scoring 30 goals on 215 shots. He had 22 assists giving him a total of 52 points on the season. Brian Elliott had 26 wins and 18 losses last year in goal for the Flyers. He had 1,338 shots against him and he surrendered 121 goals. He made 1,217 saves for a save percentage of 91%. The Bruins had 95 total points last season. They scored 234 goals while giving up 212 goals. They had 244 power play opportunities and scored 53 goals on those chances for a percentage of 22%. The Bruins allowed 266 power play opportunities and gave up 38 goals on those chances for a penalty kill percentage of 86%. They averaged 33 shots per game and as a team shot 8.60% for the season. They allowed 27 shots to their opposition per contest and had a team save percentage of 91%. The Flyers had a total of 88 points last year. They had 54 power play goals on 277 opportunities for a percentage of 19%. They allowed 247 power play opportunities and gave up 50 goals on those chances for a penalty kill percentage of 80%. As a team, the Flyers had a total of 219 goals scored while they gave up 236 goals last year. They averaged 32 shots per contest and had a team shooting percentage of 8.47%. As a team they gave up 28 shots per game and had a save percentage of 90%. The Bruins started possessions in the offensive zone 53.2% of the time while their defensive zone percentage was at 46.8% for the season. They had 2,681 face-off wins compared to 2,358 losses, meaning their face-off win percentage was 53.2%. On defense Boston had 1,775 hits and they blocked 1,093 shots from the opposition. Boston had a Corsi percentage of 54.3% as they attempted 4,975 shots on net at full strength while they gave up 4,187 shots on net in the same situations. Their Fenwick percentage was 55.1% as they had 3,792 attempts while they gave up 3,094 shots on the defensive end. The Flyers started possessions in the offensive zone 54.4% of the time while their defensive zone percentage was at 45.6% for the year. They had 2,539 face-off wins as opposed to 2,318 losses, meaning their face-off win percentage was 52.3%. On defense Philadelphia had 2,063 hits and they blocked 1,309 attempts from opposing offenses. Philadelphia had a Corsi percentage of 52% as they tried 4,938 shots on goal while at full strength while they surrendered 4,552 shots on net when they had a full team on the ice. Their Fenwick percentage was 52.8% as they had 3,634 shots while they gave up 3,243 attempts on defense. Who will win tonight's Bruins/Flyers NHL game against the spread?